Manufacturer of a wide range of products which include cold drinks cup making machine, high speed paper cup making machine, single side pe coated paper cup making machine, disposable paper cup making machine, fully automatic disposable cup making machine and hot drinks cup making machine. Owing to the expertise of our team of experienced professionals, we are able to introduce an exclusive range of Cold Drinks Cup Making Machine. This three in one machine can make, die cast, and produce cold drink cups efficiently and flawlessly. The complete production line is made of stainless steel material. Clients can avail the production as per their budget. This automatic machine is equipped with operator friendly control panel and low maintenance feature. By keeping track with the market development, we are offering optimum quality Indian Cup Forming Machine to our clients. The provided machine is manufactured using quality assured components and progressive technology by our skilled professionals.It makes one-side-PE-film-coated paper cups after running a whole procedure of automatic pre-printed fan-shape-paper feeding, cup-side-body sealing(heater), silicone-oil lubricating(for top curling, Dimethyl silicone oil 201,Food Grade), roll bottom auto punching, bottom pre-heating and pre-folding, main heating, bottom knurling, top curling and cup discharging. As one of the leading entity of this domain, we are engrossed in providing supreme quality Single Side Pe Coated Paper Cup Making Machine. This machine is used for making Pe coated paper cup. The offered machine is a semi automatic unit comprises of single production line unit. Also, the machine has an impressive feature such as accuracy and aligned production. Further, the machinery parts can be removed and replaced easily without dismantling the whole machine or effecting the production time. We are successfully ranked amongst the topnotch entity offering a wide range of Disposal Paper Cup Making Machine. 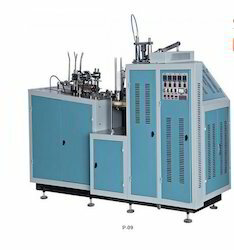 This machine is used for manufacturing paper cups. The capacity of the machine begins disposal cups per hour. The fast speed of accurate manufacturing is incredible. The machine is available in semi and fully automatic versions. Clients can choose the best suitable option meeting their business needs. With the assistance of our deft team of professionals, we are able to introduce a broad array of Fully Automatic Disposal Cup Making Machine. The offered machine is developed in accordance to industry norms and quality parameters. In the offered machine, all the components and material used have been approved and certified by OEM. In addition, this machine can be built and developed according to the specification provided by the clients. Furthermore, our professionals opt for strict quality inspection made on the machine to ensure high performance. We are successfully ranked amongst the trustworthy entities offering a wide range of Hot Drinks Cup Making Machine. This machine is used for making all kinds of hot drinks’ cups. The offered machine is available with manufacturing and single line production unit. The production line includes filling raw material, die casting, and manufacturing the cup. In addition, an accurate and quality production helps in making the cup have an accurate shape. Besides, clients can get the machine from us at industry leading prices.